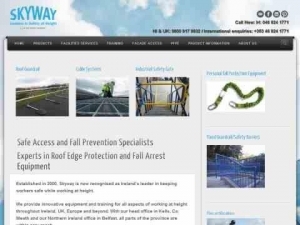 Established in 2000, Skyway is now recognised as Ireland’s leader in keeping workers safe while working at height. We provide innovative equipment and training for all aspects of working at height throughout Ireland, UK, Europe and beyond. With our head office in Kells, Co. Meath and our Northern Ireland office in Belfast, all parts of the province are within easy reach. Our core product base consists of fall prevention cable and track systems, guardrail systems, ladders, platforms, machine access, overhead systems for truck, bus and plane access – no matter what industry you work in, we can custom design a particular system to allow operatives to work safely at height, whether it be inside or outside the building.